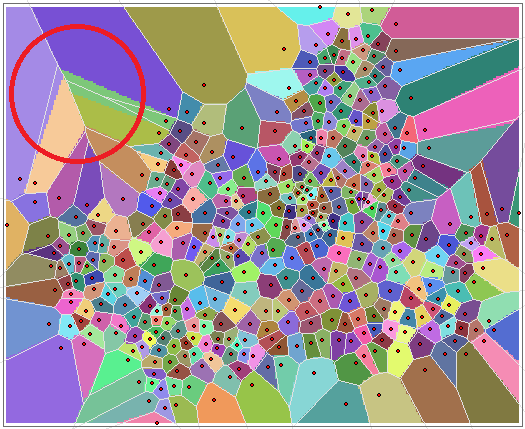 Raster 기반 Proximity Analysis 중 Euclidean Allocation 분석이 있습니다. 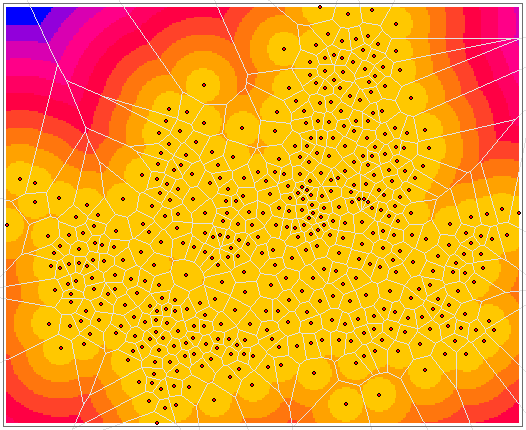 이는 포인트 데이터로 Thiessen Polygon을 만드는 것과 유사한데요, 구현 과정에서 ArcGIS 결과와 달라 한참을 헤메다가 오차 부분을 해결할 수 있었네요. 우선 그림을 보시죠. 회색 선은 Thiessen Polygon을 Overlay했습니다. When the input source data is a feature class, the source locations are converted internally to a raster before performing the Euclidean analysis. The resolution of the raster can be controlled with the Output cell size parameter. ■ 마지막으로 각 셀에 Feature의 ID 대신 거리값이 입력되면 바로 Euclidean Distance 분석이 됩니다.